During the UK’s preparation for the Brexit I wanted to try making some money on the currency exchange rate changes between the British pound and US dollar. I already had made a profit of almost 23% on the US dollar’s rise against the Euro in 2015. So this time I wanted to take my game to the next level and learn some more tricks and tips from Pros. I didn’t want to spend too much time on this, so reading thick theory books was not an option. I started to look for the best apps that could help me to learn the necessary skills and that would give me the right tools. During this process I stumbled upon a lot of poor quality and misleading apps, but eventually found these 3 great apps that I can recommend from my experience to others as well. 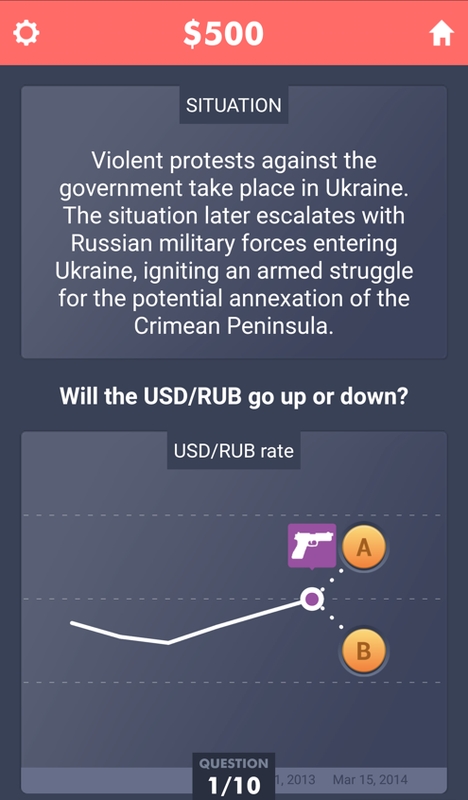 QUESTION: What would happen to US dollar / Russian ruble rate if Russian tanks entered Ukraine? ANSWER: US dollar increased in value. As is the case with most armed conflicts, the Russian military intervention in Ukraine caused Russian businessmen, oligarchs and foreign investors to dump the Russian ruble for more stable currencies. When the supply of a currency is bigger than demand it leads to its depreciation. RESULTS: By investing $100 traders had made a profit of $534. The traders who had bet $100 (with a leverage of 1:50) on the rise of the dollar when the Euromaidan protests began in Nov 21, 2013 later cashed out a profit of $534 on Mar 15, 2014, after the Crimean Annexation. Another great section of this app is the new “Golden hours”. 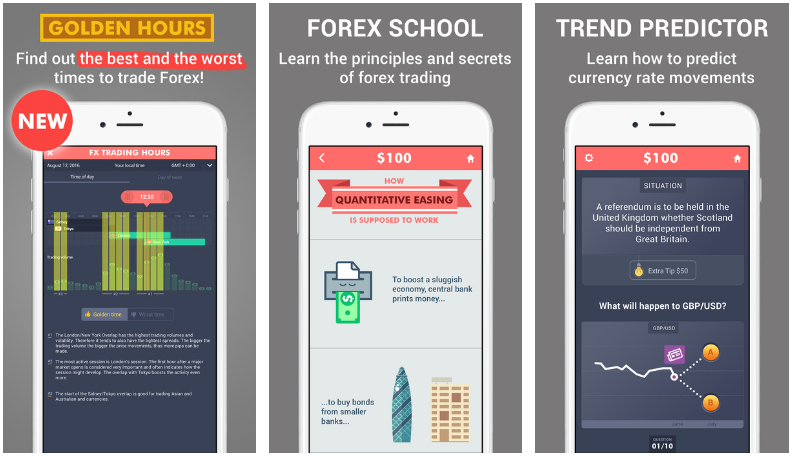 It is an interactive tool that lets you see when is the best time to trade forex and when the liquidity is so low that you can suffer losses if trading. 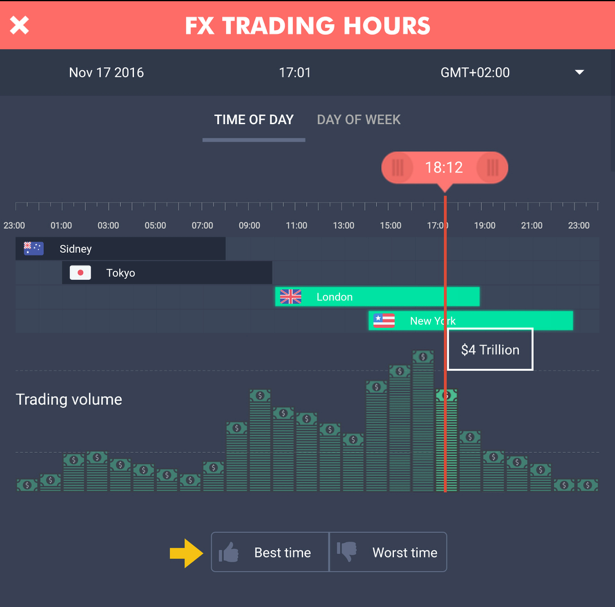 From all the forex market-timing tools I have seen, this is a clear favorite. Golden hours has an automatic time-zone detection built-in so you don’t have to check and calculate between EST, GMT, GMT+5 and other time zones, which from my experience with other apps can be quite inconvenient. You can clearly see when exactly and in which markets is the highest trading volume so that you can trade in the times that offer the biggest potential gains and avoid the risky times when the liquidity is low. There are a lot of economic events that can influence a price of a currency. Luckily a lot of these events are scheduled in advance, so with a good economic calendar traders can anticipate the currency movements and plan their strategies. 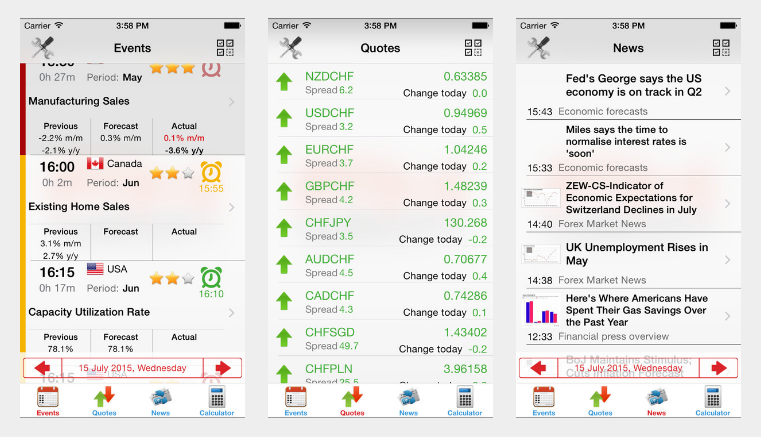 One of the free economic calendar apps that I use is Economic Calendar Forex FxTeam. The user interface could be better, but functionality wise it is one of the best we have found so far for iOS. And it doesn’t bomb you with full–screen ads of war games like other calendars do. The best feature that not all other calendars have is the possibility to select which currencies you are interested in, so you don’t have irrelevant distractions. Profitable trading ideas require fresh and relevant information, news and best of all – legitimate rumors. Do you know where pro traders get the fastest latest news about financial markets to gain an edge over competitors? Reuters, Bloomberg news sites you might be thinking? Nope. They use smart news aggregators like ransquawk.com. Note that this is a web app, not a mobile app. 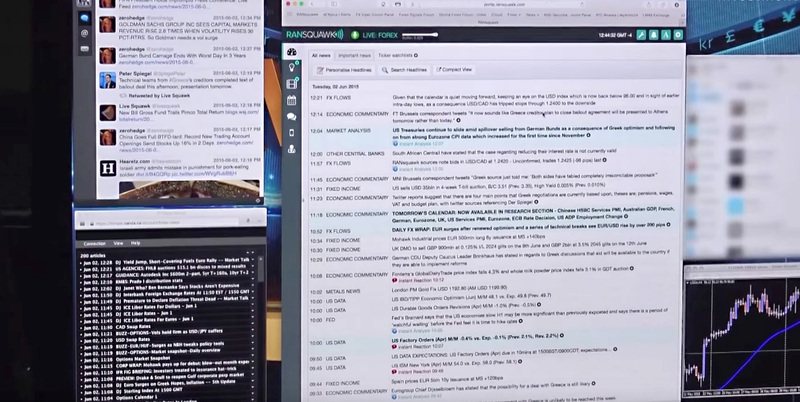 A great feature of ransquawk is the possibility to use it as a radio – to have the audio stream running in the background as you are working. Their team of analysts monitors over 100 news sources, so we don’t have to sit in the news sites. They give a heads up before key releases, and emphasize important data. So how did I do with the trading on the Brexit? Not so good to be honest :) Just like most of the traders and analysts I also made a bet that Britain would vote to remain in the EU. Luckily I had put a stop loss order, which was triggered quickly so the losses where not too big. And I managed to regain most of the loss by quickly opening a short position on the pound (bet that pound’s value would continue to drop). So the takeaway is to understand that you can have all the best tools but you can never be certain about the decisions of masses (unless you are a quantum trader perhaps). So keep on learning and stay humble!